Rid phobias, calm anxiety and manage stress with hypnotherapy. A phobia is an irrational fear of a particular stimulus. People with phobias will respond by avoiding certain situations, places, things or they will tolerate it with anxiety or can trigger panic attacks. In severe cases the phobia can end up literally controlling a person’s life. 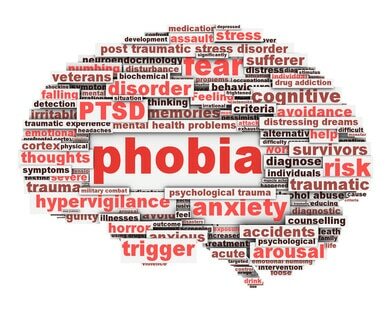 The good news is that Hypnotherapy can help to get rid of phobias! I can work with you to access the underlying cause of the phobia and eliminate the conditioned response to the stimulus with use of powerful hypnotic and NLP techniques. I can help you to help yourself to see your phobia in a different way (at a sub-conscious level) which will become less threatening or disappear completely. It is with much thanks and pleasure that I wish to relay our experience. You treated my wife in regard to a life long phobia prior to Christmas along with an added session in regard to pain relief. The results of which I have to say are not short of amazing. The phobia is gone completely and best of all my wife has no recollection of her former fear. The family are as delighted and amazed as I am at what you have achieved for us, this has improved my wife’s quality of life by a huge degree allowing her to join in activities previously denied her owing to the phobia, just awesome! The added pain relief session was another success, giving her ease without the need for pain killers for the first time in a long time, again awesome! I was with my wife at the session and you explained to us fully how the process works which I thought was very professional. I am recommending yourself to friends and colleagues who may have similar issues as I have no doubt at all that you can help them.